From here, I would like to go up along Wensleydale. Jervaulx Abbey is located in lower Wensleydale, but as the dale is very shallow and broad there, it looks like the plain. 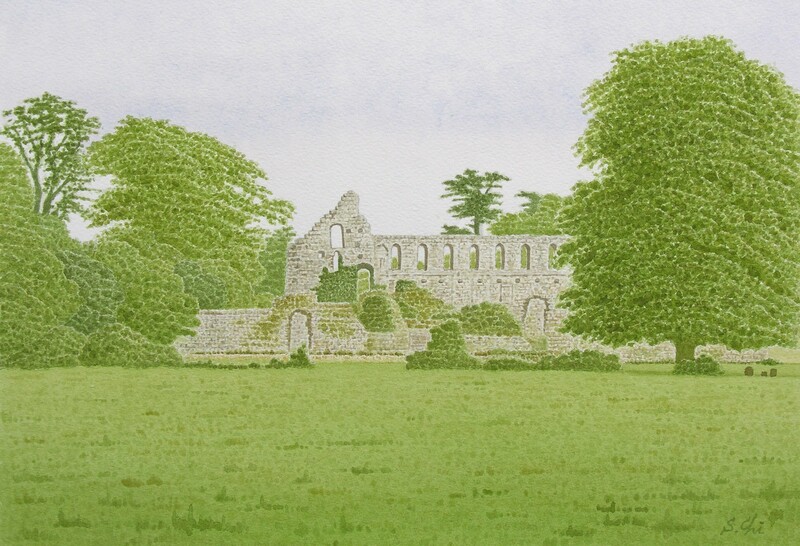 The abbey was founded in 1156 by the Cistercians and completed in about 1220. As there are only small remains of the abbey, it is difficult to believe that there was a large monastery here. Why was this abbey devasteted like this? The pamphlet says that the last abbot of here, Adam Sadbar objected to the Dissolution of the Monasteries and incurred the King's displeasure. Therefore he was hanged with a follower in 1537, and the abbey was then blown up and destroyed completely. It is said the recipe of the Wensleydale cheese was perfected first by the monks at Jervaulx, it was then made from ewe's milk. How the cheese of those days smelled, I wonder. Did it smell like the feet of priest's?